Sixteen miles of kirtan to the White House, with undersung hero Jun Yasuda | Jon Katz, P.C. Before Ram Dass visited India as Richard Alpert, the West apparently knew little about his now-famous guru Neem Karoli Baba, also known as Maharaji. Maharaji became famous once Ram Dass’s essential Be Here Now hit the bookstands. Before the Internet became ubiquitous, many fewer people than today knew about my peace mentor and friend Jun Yasuda, Jun-san remains an undersung hero, as she lives peace every minute, without a publicist, without writing articles, and usually without television cameras. If she had those, I have little doubt that she would be a superstar among millions. I met Jun-san when I needed to. I was deeply opposed to Gulf War I as having been launched much too prematurely, if ever it should have been launched, in part when considering how much Kuwait’s government– Bush I’s purported reason rather than oil for invading Iraq — is not much of a human rights prize. Jun-san was praying and drumming for peace for thirty days during Gulf War I at Lafayette Park across from the White House, just two blocks from the law firm where I was working at the time. We met one day when I walked to Lafayette Park to escape the suffocation of feeling not free to discuss my views of Gulf War I at the firm in the midst of those there displaying yellow ribbons and yellow ribbon/Support-Our-Troops words, without offsetting those views with concerns about the massive death and wounding that was being inflicted beyond just American soldiers. Before meeting Jun-san, I did not think about improving the world in terms of finding and cultivating peace within myself along the path. I was angry at Supreme Court justices who allowed executions, at law professors who kept closed-door policies when I was paying high tuition, at George Bush I for Gulf War I and more, at human rights violators worldwide, at judges too often holding indigent defendants pretrial with bonds too high for alleged petty offenses, and the list continued. I was angry. I confronted politicians in person and in writing to stop this and that trespass upon human rights and civil liberties, but did little to change my internal disharmony over the state of the world. If I wanted to become a better and more fulfilled person and lawyer, something had to change with me. I later learned, just over a year ago, that Lama Surya Das, for instance, also found it insufficient to join anti-demonstrations without improving himself from within, and to find peace. It took many years for me to get it that I needed to focus on my internal development first and foremost rather than obsessing over the world’s injustices. Fortunately, I have met critical teachers who have been there at the right times on my path to getting it. A few months after meeting Jun Yasuda, I met the late trial lawyer Victor Crawford, who was brash, likable and approachable, and seemed like anybody but a stereotypical taijiquan practitioner (as I later learned, many great taijiquan practitioners do not fit any stereotype), but he was, and I then started studying the martial art three years later and do my best to practice it daily and to apply it to everything I do. Taijiquan is an internal martial art, meaning that its practice calls for limited use of force. Its being an internal martial art, underline internal, it reminds me to look within for my development, satisfaction, and addressing imbalances in life. As my teacher Ihaleakala Hew Len says, "There is no out there for the Mind." Particularly when I accept that we all are connected, all these teachers of mine are not supposed to be there for me to latch onto, to miss when I do not see nor speak with them for long times, nor to get upset when their paths take turns with which I sharply disagree. My teachers are there to help me unlock the doors that have been stuck within me and to find and navigate the paths to being harmonious, happy and successful as a person. For that same reason, Bhagavan Das said in his fascinating autobiography It’s Here Now (Are You?) — an essential adjunct to Be Here Now — that after his many years of becoming a revered yogi in India, born Kermit Mike Riggs in California in 1945, he realized that he did not need to go to India to learn the essential lessons he learned there. He did not need to attach to any teachers. I understood that be here now message by then, but certainly was not in the now when I tried to meet him and get his autograph at the end of the evening where he led kirtan at a yoga studio in Philadelphia in 2005. Being here now is easier said than done. We know what we need to do to lose weight, but plenty of obese people are brilliant despite knowing how to lose weight. By now, I know the path towards inner peace, harmony, contentment and non-duality. However, that path remains quite the challenge when an eighteen-wheeler is tailgating me in heavy highway traffic blasting its bright lights and horn on me. My teachers help remind me to stay on that path. On my way to court last Friday for a critical felony motions hearing, Jun-san called: "Jon-san, I will be in Washington, D.C., at the temple tomorrow night" during a peace walk against the United States’ drone attacks on real and alleged terrorists and their supporters, along with some members of Veterans for Peace. My wife, son and I love spending time with Jun-san. My son and I had a great time in her temple’s enclosed loft last year, with our flashlights a blazing along with the guest cat. My wife revels in Jun-san’s positive energy, which Jun-san ascribed yesterday to my wife’s own positive energy reflecting on her perception of Jun-san. As we drank tea together, Jun-san asked if I would be joining yesterday’s last leg of the walk, from Beltsville, Maryland to Washington, D.C. Of course I wanted to join, but my family had already made plans to visit Richmond the next day. Thanks deeply to my amazing wife for encouraging me to join the walk anyway, and I did. We fluctuated from eight to nine walkers, starting from near the Costco on Route 1 in Beltsville, Maryland, and taking that Route 1 straight into Washington, D.C., turning left at Sixteenth Street to go to the White House. That is a sixteen-mile walk. I wore a banner around my neck urging that the drone attacks stop. Jun-san and Keiko-san beat the drum to the Odaimoku chant — which is the essence of the Lotus Sutra and whose acronym graces my license plate — and two of the veterans carried big flags with the symbol and name for Veterans for Peace. It was a beautiful and sunny day, starting with my needing a heavy jacket, a hat and gloves, and proceeding to my exchanging for a lighter jacket in my knapsack. 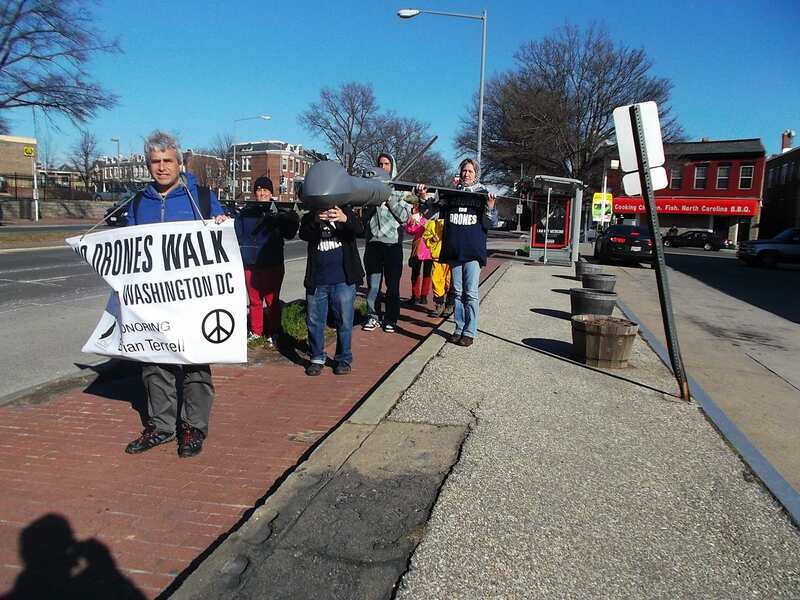 I was not under any delusion that our walk was going to convince Barack Obama overnight to stop drone missile attacks. I was heavily motivated to join the walk as part of my path of increasing my internal peace, and my greatest motivating factor was to be with Jun-san, from whom I always learn essential life lessons, and who always reminds me to stay on the path of internal and external peace. Also, last year Jun-san suggested that one can get a better understanding of the Odaimoku by joining a peace walk; my only other one with her was in 2005 for a shorter distance, and that also was amazing. Sixteen miles of walking with wind resistance caused by my banner had led to quite a bit of muscle soreness, now that I do not do long distance running any longer. It was all worth it. During the entire sixteen miles, I joined Jun-san and Keiko-san in relay chanting of the Odaimoku, with each set of people responding to the other chanting Na Mu Myo Ho Ren Ge Kyo. Never had I chanted the Odaimoku for so long during one period. This non-Hindi kirtan chanting helped focus me further on the peaceful path. Krishna Das makes sense about the benefits of chanting the names of divinity, or, in this instance of chanting the essence of the Lotus Sutra. We passed by places that I have driven by hundreds of times, but have never walked more than a mile. Along the way, some people honked in support; others asked us about our cause. As Jun-san says, we cannot make such connections from automobiles. And Jun-san believes strongly in connecting with nature, which happens when we walk. I was the only local person, and I helped navigate the walking path. When we got within two miles of the White House, the support van pulled up, and two veterans pulled out a model drone aircraft hooked up with three missiles on each wing, representing one-fifth the size of an actual drone plane. This was eerie, but certainly not as eerie nor morbid than real drone missile weapons. A mile from the White House, I took the left wing of the drone aircraft, and held it to the side of the main body of the aircraft when there was not much foot traffic in the opposite direction. We passed several police cars during the sixteen miles. I give them all credit for never stopping to ask if we had a demonstration permit (we did not) or to tell us that our First Amendment-protected display of a scary weapon was somehow verbotten. We ultimately got to the front of the White House — or as close as we could with the president’s inauguration parade bulletproof reviewing stand blocking the presidential palace — and stood in front of the White House’s entrance, just to the left of a Secret Service vehicle — on Pennsylvania Avenue, holding the drone aircraft model aloft, chanting the Odaimoku (by those who wanted to), and feeling the burn in our muscles from the long walk, standing at the end of the walk for thirty minutes in that position rather than resting. ABC and NBC still camera people took photos; a reporter interviewed the veteran holding the front of the drone aircraft; many more people than usual were there due to the upcoming inauguration; many photographed us; hundreds saw us and our banner and model drone. And here Jun-san and I were, twenty-two years after our first meeting, just ten yards from the spot where we first met.